Commercial clients are way more concerned with the future than private individuals. They often have shareholders and supervisors to answer to, and they may have to report to governing bodies months after the project is complete. They are more concerned about what they will have to do down the road than with the initial investment. Fortunately, StoneSet can help your commercial clients meet their long-term goals. Any covering in a commercial establishment will get far more traffic than a private home, and the task of keeping it clean will feature significantly in the thinking of a commercial client. StoneSet, once in place, requires very little work to look pristine. Maintenance crew will only have to sweep the surface regularly, so they can focus more time and attention on other things. The client won't have to pay as much in labour costs. Keeping the price of running a business low is part of guarding profits, so lowering the utilities will be very appealing to commercial entities. These entities won't have to spend as much time watering their landscapes since the permeable ground covering will let the rain go to the water table, keeping water by the roots for longer. Also, StoneSet is a beautiful ground covering, so it can be used as part of the landscaping instead of swathes of lawn. With fewer places covered in plants, there isn't as much need for water. There are many water-related and environmental rules that commercial entities have to obey. 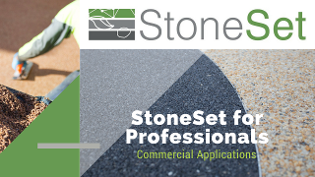 StoneSet can help them meet future water restrictions and green building requirements. StoneSet is permeable, which helps reduce water use below any restrictions a city might impose. StoneSet is a great long-term investment for businesses. If you think that your clients would like the StoneSet investment, contact us.